Wait--Intel beats and they show revenue growth above expectations? By $400 million? I thought numbers were supposedly only being made by cost cuts--what happened to that argument by the bears? That this was just a "cost cutting" rally? Didn't INTC see the article in the WSJ today? Why didn't they follow that script? Maybe its time to shed some light to the bears, and what the bulls should remember, is that in a new bull market, the one who wins is he who follows the principle of least action. When you buy at generational lows, you sit. And since INTC is having growth in netbooks, whereby data is transmitted by light, maybe these physicts and the quants should re-read William Hamilton and the Law of Stationary Action! Because he expanded on Pierre Maupertis who said, "Here then is the principle, so wise, so worthy of the Supreme Being: Whenever any change takes place in Nature, the amount of action expanded in this change is always the smallest possible." Which is the nature of the 666 market beast! The least and smallest corrections possible, and going up in a straight line--following the principles of light! But I digress on another rant. 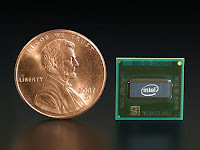 Anyway INTC boosts revenue guidance for Q4 by $500 million. And with CAPEX going down by $200 million next year, you have another penny a quarter beat built in. Because, that my friends, is just the script of the bears. And its just chicken script! For those that want INTC's press release. can you post any other good plays heading into this earnings call season? I had INTC --cheap calls worked out nicely.